This thread can be used for discussion of the planeswalker's personalities, actions and stories. Ajani Goldmane is a planeswalker who wields white magic. His specialty is magic of the purification of body and soul: spells that heal and strengthen his allies, and spells that evoke the inner, spiritual essence of others. Ajani Goldmane is torn between his leonin ferocity and his sense of justice. He was born as an outcast within his own family, an albino leonin never accepted by the rest of his pride. The only person who cared about him was his brother Jazal, the leader of their pride and Ajani's inspiration. Ajani had always shown potential as a mage and healer, but had assumed his main calling was to be a warrior in Jazal's service. The day that Ajani's brother was assassinated by unknown forces was the day that Ajani's planeswalker spark ignited, and everything changed. No longer could Ajani worry about his tiny problems of social acceptance. His quest to discover his brother's killer has led him into a tangle of intrigue woven by mysterious forces, forcing him to broaden his skills as a warrior and to unlock new potential within himself. Ajani teeters on the edge between principled justice and bloody revenge as everything he once knew crumbles around him. Ajani’s rage has been unleashed. Tempted to shed the pretense of principle and justice, Ajani now thrashes his way through secret after secret in pursuit of the identity of his brother’s killer. His pride, bereft of their leader and shocked by the violence surrounding Jazal’s death, has been scattered all over Naya. Ajani’s abilities as a planeswalker blossomed during a trip to Jund, during which he encountered the shaman and dragon worshiper Sarkhan Vol. Sarkhan helped Ajani turn his sense of vengeance into a fiery new power, unlocking a torrent of red magic in a volcanic ritual. Chandra Nalaar is a red-magic-wielding planeswalker. Her specialty is pyromancy: spells of fire, fire, and more fire. There's no virtue in subtlety—at least not as far as the fire-mage Chandra Nalaar is concerned. Impulsive, passionate, and short-tempered, she's as ready to explode as the pyromantic spells of her ever-growing repertoire. Chandra's spark ignited when she was still quite young, and as she has grown, so have her abilities as a wielder of fire magic and as a planeswalker. Elspeth Tirel is a planeswalker who wields white mana. She has powerful magic of community and fortification: spells that build mighty armies, bolster them, and protect them from harm. Elspeth was born on a plane of strife and darkness. When her planeswalker spark ignited, she left home and never looked back. She wandered the Multiverse, looking for a world where she could belong, a world that had what her true home was missing: peace, love, and community. She found all those qualities in the shard of Alara called Bant. Garruk Wildspeaker is a Planeswalker who wields green magic. His specialty is creature magic: spells that coax abundant mana from the land, summon wild beasts, and unleash the ferocity and power of his summoned creatures. Garruk is a hunter to the core, a planeswalking predator whose hunting ground is the entire Multiverse. Gripped with a need to test his might and resolve against greater and greater challenges, his life's calling has become an endless hunt of the most ferocious and dangerous game that each plane can offer. So far Garruk's travels have brought him experiences and trials he never could have imagined. The dangers he's faced have forced his abilities in druidism and creature summoning far past their prior limits, and each day his collection of trophies grows. But recently he's faced a new kind of prey: a fellow planeswalker. This is new territory for Garruk. Never before has his quarry been so crafty, so resourceful, or so elusive. Garruk's true hunt has just begun. The Planeswalker Garruk Wildspeaker has always been a skilled hunter, and his calling has been a plane-spanning hunt for the hugest and most powerful creatures in the Multiverse. But now his chosen quarry is a fellow Planeswalker: the death-witch Liliana Vess. At their last meeting, Liliana used the power of the Chain Veil artifact to curse Garruk, corrupting his power to summon wild beasts. As the curse takes hold and Garruk's fierce predator-companions become sickly fiends, he finds that he's gaining new, chilling powers of death. This only enrages him more. Gideon Jura is a planeswalker who wields white magic. Unlike most planeswalkers, Gideon doesn’t hesitate to enter combat. He also practices hieromancy, the magic of holy justice. Gideon wields a sural, a three-bladed, whiplike weapon that also serves as a focus for his spellcasting. His strong morals and sense of duty led him to serve as an agent for the Order of Heliud, an organization that sought to bring law to the plane of Regatha, adopted home of the pyromancer Chandra Nalaar. Chandra’s home, the fire monastery called Keral Keep, became an obstacle to the Order of Heliud’s goals, and the Order’s leader, Walbert, needed Chandra out of the way. He sent Gideon to intercept her on the plane of Kephalai, where Chandra was attempting to steal—for a second time—the so-called scroll of Ugin, which contains not only a powerful fire spell but the map to the Eye of Ugin, a hidden chamber on the far-away plane of Zendikar. On Kephalai, Gideon apprehended Chandra and delivered her to the authorities there, but she escaped. He tracked her to the dark plane of Diraden, where the two planeswalkers became allies in order to escape the predations of the plane’s ruler, the vampire Velrav. Only on returning to Regatha did Chandra learn that Gideon served the Order of Heliud, and that she would have to surrender herself to Walbert to prevent Keral Keep from being destroyed. With Gideon’s help, however, Chandra survived Walbert’s persecution and gave Gideon reason to question the Order’s true motives. Then she departed in search of the Eye of Ugin. Jace Beleren is a Planeswalker who wields blue magic. His specialty is mental magic: spells of mind-reading, illusion, knowledge, and deception. Curiosity has always gotten the better of Jace Beleren. As a magical prodigy, he delved into lessons of sorcery deeper than the other students in mage academies, and succeeded to the point that even his instructors were suspicious of him. As a specialist in mind magic, he uses his abilities to gaze into the minds of others, discovering even closely guarded secrets. This practice has led him into danger more than once. In fact, his mind magic has helped him discover the existence of planeswalkers and of worlds beyond his own, opening his eyes to an even greater scope of secrets. Now that Jace's own Planeswalker spark has ignited, his curiosity has begun to take him deep into the Blind Eternities, the chaotic void that holds all the planes of the Multiverse. Jace has finally found a milieu vast enough to satisfy his thirst for knowledge. Jace now faces the same problem of every exceptional being: the temptations of power. His skills in illusion, mind-reading, and even memory modification have flourished during his travels, and they've helped him gain ever broader access to the secrets he craves. The silver golem Karn is a Planeswalker who can wield all five colors of magic. He was created to endure time travel and to serve as the key to the Legacy. Over a thousand years ago, the Planeswalker Urza created a new weapon in his war against Phyrexia: the silver golem now called Karn. Urza's plan was to send his creation back in time to when Phyrexia was a nascent threat. The plan backfired and the island of Tolaria was devastated. But Karn had many other purposes to serve. The golem was also the first artifact of the Legacy, a collection of objects whose arcane might would eventually be used against Phyrexia. He was given the heartstone of the rogue Phyrexian sleeper agent Xantcha, once Urza's ally and companion. Centuries later, it was Karn who rescued the human component of Urza's Legacy from Phyrexian raiders: Gerrard, who would become captain of the Skyship Weatherlight. Decades after, when Phyrexia invaded the plane of Dominaria, Karn fulfilled his destiny by taking his place within the Weatherlight hull, surrounded by the artifacts of the Legacy. The ship became a weapon, delivering a devastating blast of white mana that destroyed Phyrexia's "god," Yawgmoth, the Father of Machines. At that moment, Karn became a planeswalker, inheriting the Planeswalker spark from his creator. Karn later created a plane of his own: a metal world he called Argentum. When he brought the Planeswalker Jeska to see his plane, he introduced a contagion from Dominaria to his world—a Phyrexian substance to which, as a Planeswalker, he was immune and unaware. As Karn explored the Multiverse, the Phyrexian contagion took hold, reshaping the plane and corrupting the mind of the Warden that Karn had left to watch over his creation. Even when Karn returned to Argentum, now called Mirrodin, and set things right with his world's inhabitants, the contagion continued its quiet work. During Dominaria's temporal crisis, Karn was called on by his friends Jhoira and the Planeswalker Teferi, both of whom were once students at Tolaria. Together with a new ally, Venser, they worked to prevent time itself from collapsing by finding those who were willing to surrender their Planeswalker sparks to heal the temporal damage. Karn accepted the task of healing the greatest of these time rifts: the one he had helped create at Tolaria. And although he succeeded, at that moment he became aware of—and susceptible to—the contagion he carried. In his last moments as a Planeswalker, he hurled himself through the Multiverse to Mirrodin, instructing his friends not to follow. His mind addled and broken by the Phyrexian corruption, Karn found himself inside Mirrodin amid a fully fledged Phyrexian ecosystem. The contagion had caused Mirrodin to grow tendrils into the plane's core of raw mana, vastly accelerating its Phyrexian metastasis. Karn was hailed as the next Father of Machines by the new Phyrexians. Koth is a planeswalker who wields red magic. His specialty is geomancy, spells that move mountains, shatter stone and melt iron. His earth magic has a special strength in it that allows him to purify metal, which reflects Koth’s own inner desire to bring peace and harmony to his people. Planeswalker. Elder Dragon. Tyrant of Worlds. Nicol Bolas is one of the oldest known beings in the Multiverse—he has lived for many millennia. His malevolence is matched only by his boundless intellect. Nicol Bolas has survived multiple wars, cataclysms, and rivalries: the dragon war that left only five of the elders alive, the destruction of his Madaran Empire on Dominaria at the hands of Tetsuo Umezawa, and epic duels with the planeswalkers Leshrac and Teferi. He also survived The Mending, the healing of the Multiverse that changed the very nature of the spark and cost several planeswalkers their lives. Bolas left Dominaria as it crumbled in the time before The Mending, implying that it couldn't be saved. "I have prepared a suitable place for myself in that eventuality," he said before departing through the Talon Gates. In fact Bolas has already begun to plot his next scheme for power. His ‘suitable place’ is the five shards of Alara, which Bolas has been watching for decades. Long ago he began to recruit agents on the shards—individuals and even entire groups who would secretly do his bidding. These agents have subtly, secretly sown the seeds of dissent on each shard, creating chaos and conflict. Why? Only Nicol Bolas knows the truth: The shards of Alara are reconverging into a single plane. And when that reconvergence comes, Bolas wants all-out planar war for reasons unknown to any but himself. Nissa Revane wields green magic to muster her people and amplify their might. But recently she has begun using black mana covertly, believing it a necessary means to move the elves toward their rightful place. The sternly beautiful Nissa Revane is a proud and ruthless nature-mage. She seeks to prove that her people, the elves, are the true heirs and best stewards of the planes of the Multiverse. Nissa prefers deeds to words, though, and she has become a master summoner of her elvish allies so their blades and arrows can do the talking. Nissa hails from Zendikar, where her own race fights for survival against an increasingly savage ecosystem. The elves of Zendikar span many of its continents, and Nissa leads a large tribe known as the Joraga. Weakness is a luxury no one can afford on this fierce plane, and as a result Nissa despises weakness in others. Her planar travels have taken her to other places where elves thrive or even rule, such as the sunny world of Lorwyn. There she met elves who fully embraced their role as the pinnacle of nature, using both life magic and its shadow to assert their primacy. This encounter led Nissa to experiment with black mana on her own terms, in secret, using it to complement her own elvish teachings. Sarkhan Vol is a planeswalker who can wield both red and green magic. His specialty is draconic shamanism: spells that summon dragons and evoke the rage and passion of dragonkind. Sarkhan Vol comes from a plane where territorial warlords vie against each other in unending, brutal war. On this plane, dragons have long since been hunted to extinction for sport and glory. Sarkhan belonged to a shamanic circle that venerated the dragon as the ultimate predator, the purest expression of the consuming urge of all life. During a deep shamanic trance, Sarkhan had a vision of an ancient dragon-spirit, and it was during this transcendental moment that his planeswalker spark ignited. On the realization that other planes existed beyond his own, Sarkhan began his quest to understand the dragon spirit, to find a plane where he could look a dragon in the eye. After many years of searching the planes, he found Jund, a world tyrannized by dragons, and knew he had found his prize. It is here that Sarkhan seeks an exemplar of dragonhood, the ultimate expression of predatory perfection worthy of his worship. Servitude to the ruthless planeswalker Nicol Bolas has taken its toll on the sanity of Sarkhan Vol. Sarkhan had searched the Multiverse for a dragon ferocious and powerful enough to be worthy of his worship, and found it when he encountered Bolas on the plane of Alara. But ever since pledging his fealty to Bolas, the consequences of Sarkhan’s decision have weighed heavily on his soul. As he planeswalks throughout the Multiverse, keeping tabs on other planeswalkers and doing obscure errands for his new master, voices of doubt plague his mind. Sorin Markov is a vampire and a master of sangromancy, a dark corner of black mana specialization. With this blood magic he can drain the lifeforce of other beings, place curses on enemies, and even possess the minds of others. With the exception of the elder dragon Nicol Bolas, the vampire Sorin Markov is older than all other planeswalkers described here—older than all of them combined. His multiple millennia have brought him detachment and easy confidence. Unlike Bolas, Sorin doesn't concern himself with gathering power or control. He is content to follow his whims, even when those whims are cruel or deadly. Sorin is well traveled and well heeled. Having seen hundreds of planes over thousands of years, he has become a sort of bon vivant, seeking novelty and new diversions. But despite his fundamentally hedonistic nature, Sorin does feel the pull of more lasting concerns, and over his long life this tendency has resulted in an arcane schedule of engagements and forays to far-flung planes. As a result Sorin is a busy man, planeswalking frequently to pursue concerns known only to him. Sorin always seems to have business elsewhere. For Tamiyo, every plane holds a mystery that sets it apart from all others. Tamiyo travelled to Innistrad to explore the mystery of the silver moon. Tamiyo has been observing Innistrad for many cycles, using her powers as a planeswalker to gain insight into the force it exerts on the world. She has watched with rapt attention the moon's effect on the lycanthropic curse, and she has written extensive notes on the ebb and flow of vampire frenzies in relation to the moon's influence. Her curiosity eventually led her to the door of the famed astronomancer Jenrik. Tamiyo spent months in his moonstone tower poring over countless charts, adding her own observations to his collection about the odd power the moon holds over the denizens and populace of the plane. 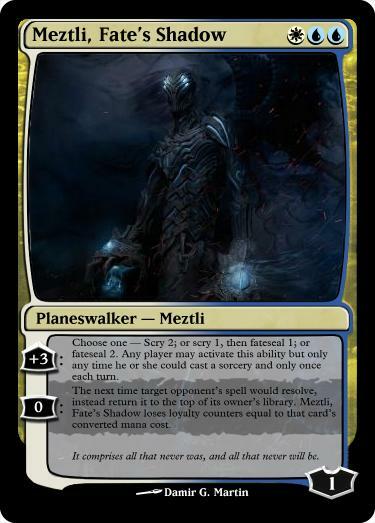 Tezzeret is a planeswalker who wields blue magic. His specialty is artifice: spells that forge artifacts, manipulate artifacts, and even bring artifacts to life. Tezzeret was a talented artificer from the Alara shard of Esper. Like all Esperites, he has part of his body "enhanced" by the magical alloy etherium, part of an overarching planar venture to create perfection of both body and mind. Tezzeret became an initiate of a mage sect called the Seekers of Carmot in order to gain access to the Codex Etherium, a sacred tome the sect claims to have in its possession. When he intruded into the sanctum of the Seekers, he uncovered truths that others didn't want him to find, and he found himself trapped in a conspiracy much larger than himself. Mortally wounded by the guards of the Codex Etherium on the shard of Alara called Esper, Tezzeret's spark ignited, hurling his battered body through the Blind Eternities to Grixis, where he laid dying. Revived by the scheming dragon Nicol Bolas, Tezzeret was forced to accept servitude in exchange for his life. Bolas allowed Tezzeret to believe he had seized control of part of his network, a cabal known as the Infinite Consortium. On the plane of Ravnica, from which Tezzeret led the Consortium, he recruited fellow planeswalker Jace Beleren, hoping to use him as a powerful pawn. But Jace had other ideas, defeating Tezzeret in combat and erasing his mind almost completely. Bolas retrieved his servant's body from the æther, rebuilding it for a sinister new task. The student of an Innistrad necromancer, Tibalt tried to follow in his master's footsteps, cobbling and reanimating corpses. But he lacked the talent and discipline for the dark, exacting work. Nursing a growing seed of hatred fed by his own failures and isolation, he began to turn his talents toward the realm of the living. His experiments tested the ability of living organisms to withstand pain. Tibalt used only vermin at first but then moved on to larger animals and eventually humans. As if summoned by the evil nature of these new experiments, devils began to gather near Tibalt's laboratory at night, whispering in their strange chittering tongue. In time the devils offered Tibalt insights into what fascinated him most: the true nature of pain. Filled with a sense of power, Tibalt grew more sadistic and more careless, oblivious to the whisperings of the townsfolk. Venser is a planeswalker who wields blue and white magic. His specialty is teleportation magic and building his own unique and powerful artifacts. Venser is brilliant and able to think fast on his feet to find a way out of any sticky situation he encounters. He relies on his knowledge of artifice and teleportation to pave his way through the Multiverse, where he satisfies his boundless curiosity of all things mechanical. Vraska is a Planeswalker who wields a suite of deadly spells that suit her gorgon nature. She specializes in magic that involves assassination, stealth, and petrification. During her time on Ravnica, Vraska has provided certain dark services to the Golgari guild. Her magic helps her track her chosen mark through the fungus-choked tunnels of the undercity, allows her to destroy her victims quietly, and when necessary, lets her summon shadowy killers to do her dirty work for her. The Golgari see her as a useful enigma, a shadowy death specialist who only responds to the jobs she wants, and who requests strange favors and obscure trophies in return. Vraska stays largely out of the guild politics on Ravnica and seems to care little for the inner workings of the Golgari Swarm. She gets the job done and departs again, not to be seen until there's another mission that interests her. Any word on when we will be able to save cards? I like the card maker, but without saving, and with the whole "attachment" way of posting the cards it becomes tedious and annoying when you realize you've made a mistake in a card and have to completely recreate it. Took me 4 hours and an entire half-season of Breaking Bad to color this in. Hey there Good Peoples of the Forum. The link above is updated almost 5 times daily so if you want to see em first they will be there. I am in the processes of making a fantasy cube and i really like some feedback or crazy idea's. Keep in mind that the Cube format is casual and that cards can be stronger for the sole reason theres only 1 of each and decks are never counstructed. There for the cards dont have to match standart magic, but just match each other. The Cube have now been upped a bit, we are making a program that generate boosters so now we can play it drafty but we programed the drafter to only let each Rares and Mythic appear once per draft but common and uncommon can come up multiple times. Hope you like some of the idea's and come with some of your own. This post is updated, Daily. Updated: 13-06-2014 *Vanguard Inquisitor* Have a Tap Added to its Ability. Updated: 16-06-2014 *Spelling Error's and Wording fixes. Updated: 19-06-2014 *Lord of Glastheim have been changed, to fit his bill now you must sacrifice a land instead of discarding a card. God guys are you choking on barbarians by now? Had enough Barbarians? choke on Tribal Merfolk! A bit of Mono Black to the Vampire Front. Guys I'm running out of space! How can i keep posting when the space on all my posts is just about used up? You've probably noticed by now that you can 'like' your own posts, I'd say that's in need of revision. 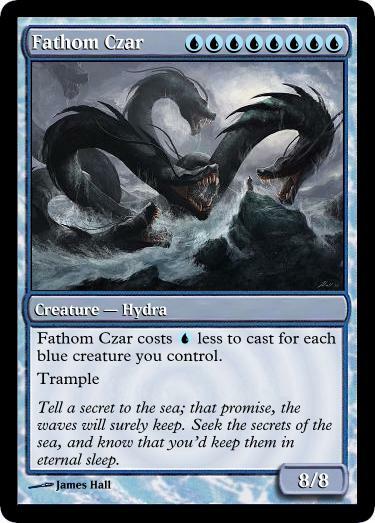 As the theme is colour, here is a colourshifted Khalni Hydra. Woah there, Captain! Stop punching yourself (and me, for that matter) with the toxic broom of anger! This tirade of yours filled with "InvalidInvalidInvalidBiasedMoronic" is not only very harsh, but also just full of factual errors. First of all: What the hell man?! Calm down. Seriously, I'm happy that this forum rarely has members reacting as aggressive as yourself. It is basically the same Legendary Demon we've always seen, above average/high manacost, black or red aligned, some kind of drawback for which you usually don't care, because that demon is super strong; It is nothing new, not even in the slightest regard. New cardtypes are not added all the time, except for new races etc (but that's rare). Anyway, you might add as many number of custom creaturetypes as you desire (obviously), yet, anyone looking at your cards can decide whether he likes your addition to the game; Putting the card's faction in the types, is a genuine bad idea. You don't have the types Orzhov, Akraoan, or Jund etc. Only because there are red and/or black cards with vigilance, it doesn't become a viable mechanic for the colors. There is NO FLAVOR AT ALL in the connection of Grimrot and Vigilance, nothing in its mechanics (or even its artwork) that makes Vigilance in anyway stand out as a remarkable trait of this character. So. I calmed down (don't know about you, maybe you will soon honor me with a furious answer, calling out all of MY mistakes; I'm looking forward to it). Maybe I'll go and play some Don't Starve now. You know this game? it's bananas! Erza Scarlet from Fairy Tail! #7388 Is this R/W Angel Balanced? It's not a well known fact, but a common misconception. Angels are not female, they are genderless constructs, living creatures created by various superior beings. They are genderless, but usually take a physical form representing their alignment/mentality/powers, as well as their tasks. Since nearly all angels are associated with white mana and serve as guardians, protectors, and emissaries, beacons of order and hope, it is only natural for them to be given and/or choose a female physique, since this is (usually) the most direct symbolism you can associate them with. But if you want to, you can give them beards and horns in whatever quantity you desire; That's one of the greater assets of character design: Bearded Angelic Lumberjacks. Meztli once had a very different form. This version is the result of ripping the spark from the rest of him/her, and infusing it with mana, in an attempt to recreate a pre-Mending spark. What resulted was a mere shadow of the former Meztli, lacking both its former power, and true sentience. Not entirely sure as to how to balance it. So how did I do folks? All art is not owned or created by me. Just placeholder to give you an idea of the character/effect. So I'm starting a 925 card set called Shadows of Derethia. These are the thirty five cards. #106812 Brightsteel Angel Mindless Horseman and many more! Scry X, where X is the highest CMC among permanents you control, then draw 3. You might be inclined to compare it with Rush of Knowledge or Interpret the Signs. Rush of Knowledge loses value if you don't have any high-CMC permanents. Interpret the Signs is prone to whiffing if you have terrible luck with lands.